CHURCHILL abattoir in southeast Queensland has announced that it will close its doors from the end of September, in a dramatic reflection of the parlous financial state of the Australian red meat processing sector at present. The company issued a statement yesterday, confirming the plant’s last day of operations as Thursday, 28 September. There’s been speculation for much of 2017 that attrition was likely in northern processing closures sometime this year, as the industry battles a national herd size at 20 year lows, forcing cattle prices to record highs and starving plants of much-needed throughput. While there have been several smaller beef plants in southern states closing their doors in recent months, Churchill is the first significant business in Queensland to shut. But far from simply a ‘strategic closure’ for a few weeks or months until trading conditions improve, there’s no clear indication that Churchill will ever re-open. As extraordinary as it sounds, the shock closure announcement has left the nation’s largest supermarket retailer without a northern beef kill, in just four weeks’ time. Woolworths at this time does not know where its beef will be processed in Queensland from 29 September, when Churchill turns out the lights. That clearly suggests that the closure decision was extremely sudden, possibly as recent as Friday. 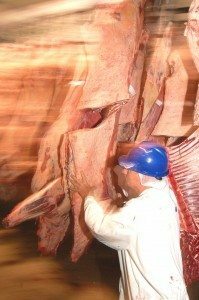 About 500 staff will be impacted, including 140 at Churchill abattoir, and 130 in the adjoining Woolworths Brismeats boning room, which also closes at the same time. It’s been confirmed that boning will in future happen at a yet-to-be-determined new service kill supplier’s plant. Woolworths’ value-adding facility next to Churchill will continue to operate, until mid-2018 (see references below). The circumstances clearly reflect how suddenly the closure decision was made by Churchill’s owners, Barry Moule and his partners. “While we will continue to attempt to attract investors, it is prudent to shut down our business, while we are able to make all payments/entitlements to our suppliers/employees,” Mr Moule said in Churchill’s statement issued yesterday. “Without the capacity to pass-on increasing costs, our customers have struggled to maintain cattle numbers, and without numbers, we do not have a sustainable business,” the company said. While Churchill also performs service kills for other smaller wholesaler customers, the overwhelming majority of operations are devoted to kills to supply Woolworths’ northern supply chain. Up to 2300 Woolworths cattle per week went through the plant, although for the past six months, kills have been restricted to four days a week. Woolworths has had a service kill contract with the Churchill abattoir for the past 20 years, supplying beef into the business’s northern supply chain, feeding supermarkets throughout Queensland and northern NSW. So close was the relationship that Woolworths set up its own Brismeats boning room and value-adding facility adjacent to the Churchill abattoir. The business made attempts two years ago to find an offshore equity partner, announcing a deal with a Chinese investor in this earlier Beef Central story, which ultimately fell through. Parts of the plant are regarded as somewhat dated, having been originally part of the network of five antiquated Queensland Government-owned public abattoirs across the state, designed to provide service kills for wholesalers, and in some cases, exporters. It may provide part of the reason why Churchill has not moved to export status. Woolworths performed its first kills at the site 20 years ago, while still under government ownership. As Australia’s largest domestic-only abattoir, Churchill is regarded as something of a ‘dinosaur.’ Sources suggest export access provides credits of up to $100 a head on slaughter cattle that are otherwise destined only for the Australian domestic market – particularly for difficult-to-sell items like offals. In this sense, it is perhaps surprising that Woolworths has remained aligned with Churchill as long as it has. Major supermarket competitor, Coles, has had export market access via its northern processor, Australian Country Choice, for ten years or more. “Our customers need to extract the additional revenue that stems from being export accredited,” Churchill’s statement issued yesterday said. A Woolworths spokesman said the unprecedented rise in livestock prices, and overall shortage of slaughter stock had made it tough going for many in the meat industry, with most plants on greatly reduced kills for the past 12 months or more. Under these conditions, Woolworths itself had been operating only four days a week at Churchill since September last year. “That’s a factor in the decision,” Woolworths head of meat, Pat McEntee told Beef Central. “We understand this is a difficult decision, and will have an impact on our team members at the facility. Woolworths is committed to working closely with all our team members during this time,” he said. The Churchill closure decision has rocked the local community of Ipswich west of Brisbane, which also learned earlier yesterday that chicken processor, Steggles, plans to close it local processing facility, with the loss of another 700 jobs. What happens now to the Woolworths Qld kill? Woolworths has confirmed to Beef Central that at this point, the company does not have a kill secured for its Queensland operations from 29 September. “However our commitment to Queensland farmers and feedlots is ongoing,” Pat McEntee said. “Queensland is just such a significant and critical part of Woolworths overall Australian beef supply chain. Our buying teams will continue to work directly with farmers to source livestock from the state, and our beef processing requirements will transition to a new partner,” he said. Given that there is surplus capacity in virtually every beef plant in the state, that search should not be too difficult. In fact most operators would covet a weekly service kill of the size of Woolworths’, in order to underpin plant utilisation. JBS Dinmore – only 15km or less from the Churchill facility. Best geographic fit. Teys Beenleigh – Shaping as the favourite. Still within easy access of Woolworths’ new retail ready facility and distribution centre. And Teys already carries out a major kill for Woolworths at Tamworth. Oakey Beef Exports – in the middle of an expansion phase, which could motivate Oakey to secure a large service kill customer like Woolworths. Significantly, all five offer the attractive export ‘window’ for some items produced from the Woolworths kill, as described above. Woolworths has ruled out any prospect of shifting the Churchill kill and bone south, to its existing processing facility at Tamworth in NSW. Most of its contracted feedlots are on the Darling Downs, or nearby areas. What happens to Woolworths’ retail-ready operations? Woolworths will continue to operate its retail case-ready business (slicing, mincing, sausage-making, and packaging of cuts ready for placement on retail shelves) at the Churchill site until the middle of next year. From around 2020, a new retail-ready facility to be built on a site at Heathwood, mid-way between Ipswich and the Gold Coast, will be commissioned, replacing the current Churchill facility. This will be the third such retail ready facility built in Australia by the Woolworths/Hilton JV, joining similar multi-species installations in Melbourne and Perth. Work on the new site is due to start in the ‘near future.’ When completed, it would be the world’s most modern case-ready meat facility, the company told Beef Central. Can Churchill find an investor, and re-invent itself as an export plant? It’s known that senior management is in China this week, re-engaging with potential investor contacts. Some say the departure of Woolworths may in fact make the site more attractive to an overseas investor, rather than less, because it potentially frees-up access to available boning capacity, currently almost entirely occupied by Woolworths. But as everybody knows, processors’ ledgers are awash with red ink at the moment, which potentially makes it very difficult to attract an enthusiastic offshore investor prepared to spend the money required to transform the Churchill facility into an export-licensed plant. One estimate suggested $30 million would need to be spent on the boning room, alone. Maybe be now JBS at Dinmore can get rid of the 457 visa workers. No excuse for it now there is trained people out of work. Employ Australians. what about ncmc @casino they are struggling to get 4 days a week kill any word from the board or management wether that are in apposition to take on woollies ,they used to kill there some years ago? Cast one’s mind back less than three years ago. Some prominent cattle farmer representative organisations insisting Senate enquiries into processor collusion activities. Opponents of this strategy (me included) penned it a useless waste of taxpayer resources that would ultimately uncover nothing. Serious public apologies need to be made as yet another unfortunate plant closure here unfolds.